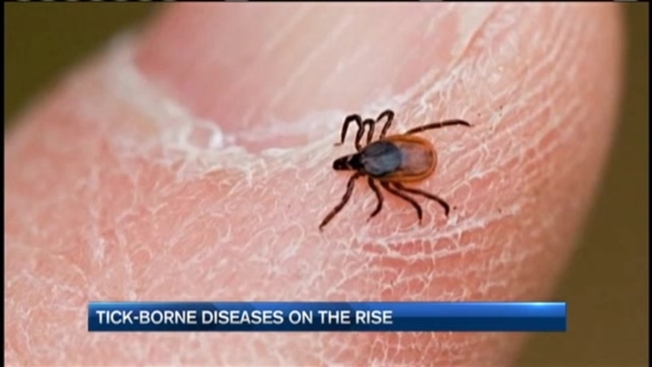 Researchers say the tick population, and the threat of Lyme disease, continues to grow in New England, and climate change is contributing to the problem. The Natural Resources Council of Maine presented a report by the National Wildlife Federation Wednesday, which states warmer winters "serve as a welcome mat for pests like ticks to expand their range." Senator Jim Dill, who is a pest management specialist for the University of Maine Cooperative Extension, said climate change has helped ticks thrive in Maine. Dill said warmer temperatures and heavier rains support tick populations in the summer, and in the winter, they have been protected by an insulating blanket of snow. "They were fat and happy all winter long," said Dill, "and we're seeing a lot of ticks in the spring." With more ticks, comes more concern about diseases such as Lyme. In Maine, there were 1,400 reported cases of Lyme disease in 2014. That's up from 300 cases in 2005. "We have a problem of epic proportions on our hands," said Cheryl Farley, who was diagnosed with Lyme in 2010. Farley is urging New Englanders to perform tick checks, and become educated about the threat of tick-borne illnesses. "Be your own advocate," said Farley. "Our medical community is so behind the eight-ball on this." Environmental groups like the Natural Resources Council of Maine are using this evidence as further proof that politicians need to act on climate change, and support the Clean Power Plan.